This recipe, which was sent to me by my friend in Ohio, is excellent. 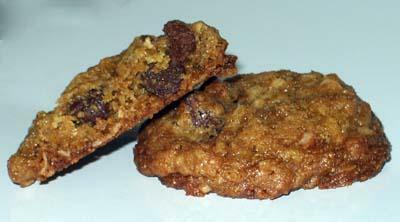 The texture of these cookies is dense, tender in the middle, but crunchy around the edges. Beat shortening, butter and brown sugar together in large bowl until light and fluffy. Add egg, water, vanilla; beat well. Combine whole wheat flour, baking soda, and salt; stir into creamed mixture. Stir in oats, dried cherries and chocolate chips. Drop by teaspoons onto lightly greased cookie sheets. Bake at 350 for 12 minutes or until golden. Remove and cool on wire rack. Well now, there’s a soft spot on me, because Almond Roca is my favorite sweet!Please DO post that one! This blog is the best one so far!! I am a self-indulgent cookie beast.I once made the so-called nieman marcus cookies and discovered that the best kept secret to the cookie base is to add in the blended oats but stave off on the brown sugar a bit.I’d kill for a bag of cadbury’s milk chocolate chips. Hi Bassizzzt,I hope you like them. They’re pretty wheatlicious. Good blog! Great recipe for me to try out for cookies, I might even do this tonight.